and feel the warm jets of the spa heating up cool autumn nights. they need is someone to step in and make it a reality. That’s where you come in. goes directly to your sales team. The only thing more fun than having a dream is when it all starts to come together. No longer do consumers walk into a showroom and simply ask what you have to offer. Today’s consumers are empowered by technology and want tools that put them in control. 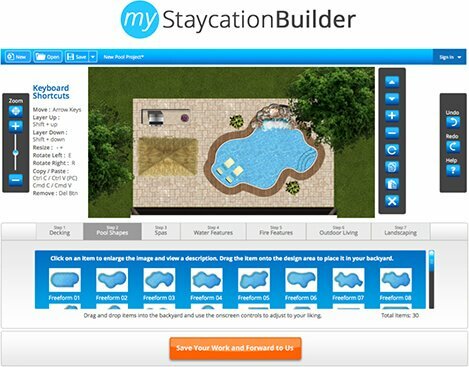 MyStaycation Builder allows website visitors to choose from hundreds of design elements and go from just dreaming about a pool to picturing it in their own backyard. While they’re having fun designing, MyStaycation Builder is collecting valuable information to pass along to your sales team. These are real time leads delivered directly to your inbox that can be qualified using the information they provide. 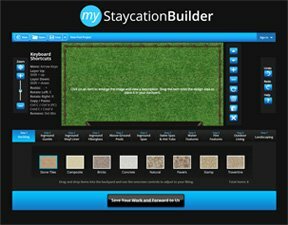 MyStaycation Builder is an innovative sales tool that engages the consumer in the design process and positions your company as the logical next step. Better equip your sales team with information to offer the right products and services and recognize the right opportunities. Speed up the consultation process by helping customers make big design decisions before they walk into the showroom. Never miss a lead by capturing valuable information in real time, 24/7 . They design the backyard of their dreams. You get the information you need to make the sale. It’s Fun, Fast, and Easy. 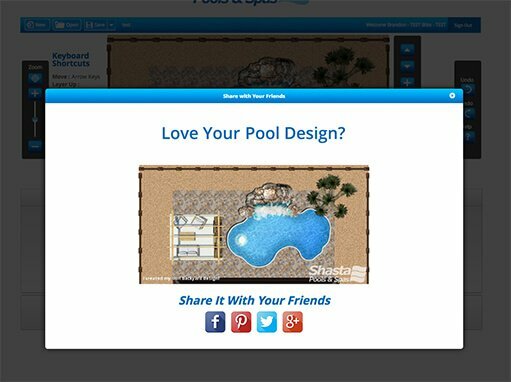 Our easy-to-use interface allows users to drag and drop elements on the design area to build the backyard of their dreams. Users can choose from all types of materials and features and explore ideas they might have never thought about. It’s easy for users to make changes and try new things until they settle on the features and design they want you to build. By providing their email and contact information, users can save up to 3 projects at a time to come back to later. 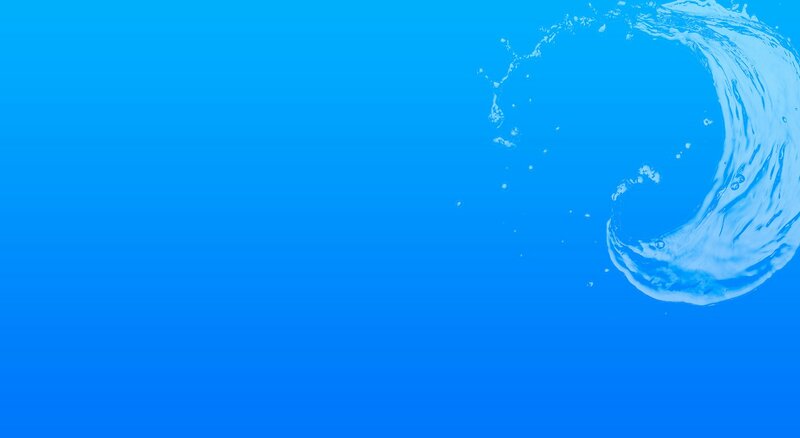 The entire process takes place directly on your website and your company’s logo appears on every design. Users can easily share designs across their social networks, giving your company added exposure and inviting others to your website to try the tool for themselves. HOW DOES THE DESIGN TOOL WORK? 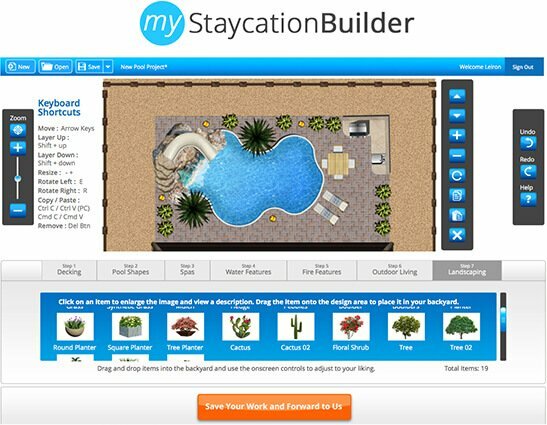 MyStaycation Builder is designed to be an easy-to-use and fun sales tool that acts as a natural connection between browsing and becoming a customer. 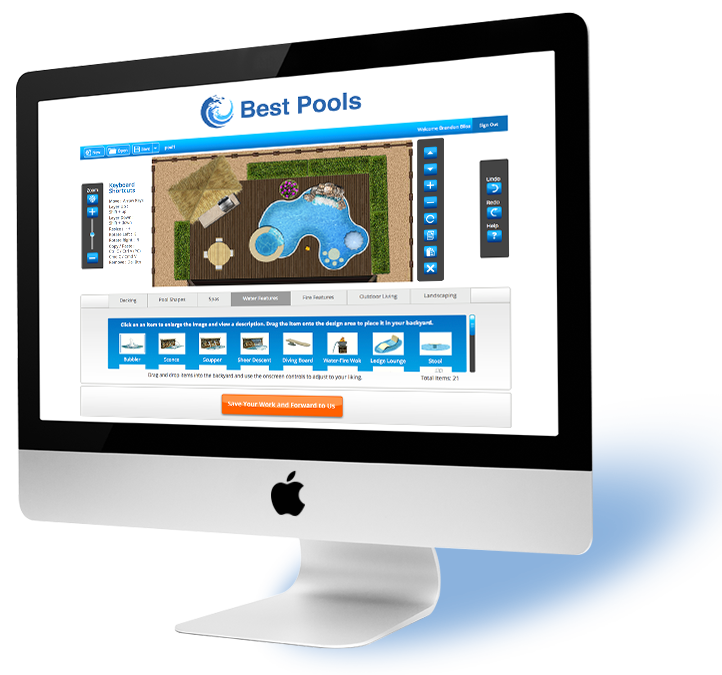 Within minutes, visitors to your website can create the backyard of their dreams using intuitive controls while funneling themselves into your new 24/7 automated lead builder. Use our Test Drive feature to see how fun, simple, and effective MyStaycation Builder can be for your business. 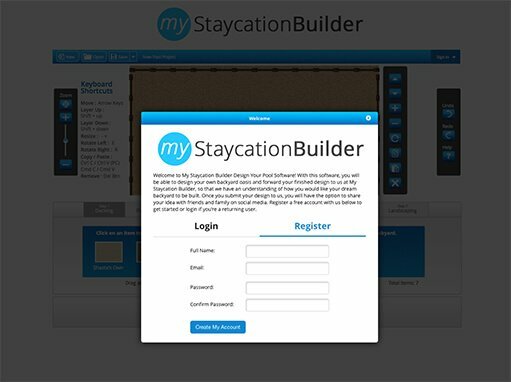 ( yourcompanyname.mystaycationbuilder.com ), the user will encounter a screen that welcomes them to the design tool along with the option to either login or register. In order to save their work, the user will need to register with their full name, email and a password of their choice. They will receive an email with a confirmation of their registration and have access to login to the design tool. Your company will receive a notification of the user registration so that you can capture lead information at the very beginning. 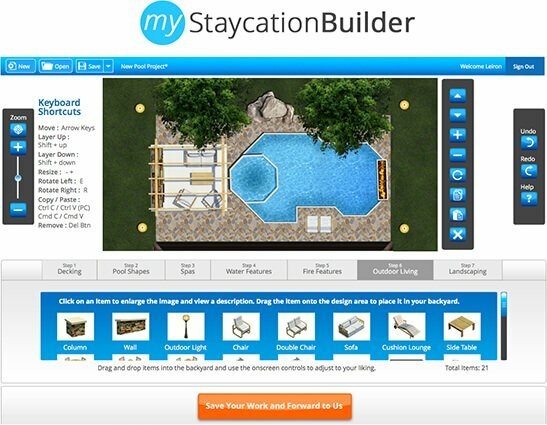 The MyStaycation Builder interface allows your customers to have full control over their design. At the top of the design tool, users will have the option to create a new files, save a file, open an file or sign in and log out. To the left of the design area, there are zoom options as well as a list of handy keyboard shortcuts. On the right side of the design area, we have tools to manipulate the individual design elements. You can bring and item to the front of another layer or send it behind, enlarge/shrink, rotate, copy/paste and delete an object. Farther to the right is a toolbar that allows you to undo or redo an action or view or step by step help tutorial. For more information on how it works, please visit the help tab on the design tool. 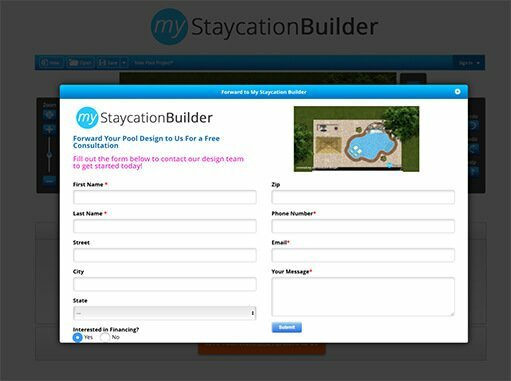 The MyStaycation Builder design tool will capture the lead’s first name, last name and email at registration and will send your company a notification via email. Once the user is registered and is finished designing their project, they will be able to click the “Save Your Work and Forward to Us” button. This will bring up a form with a preview of their image and additional contact information fields. Once the customer fills out all of the information and hits submit, your sales team will get an automatic notification with all of the customer’s information as well as a link to view an image of their project. Once the customer has submitted the form to forward their design to your sales team, they will have the option to share it on Facebook, Pinterest, Twitter or Google +. They will be able to add their own description before posting and their image will be attached to their post. Your company logo watermarked at the bottom right for added protection. This is an easy way for the customer to get their family & friends’ opinion, as well ad market the design tool on social and get more leads in your inbox! 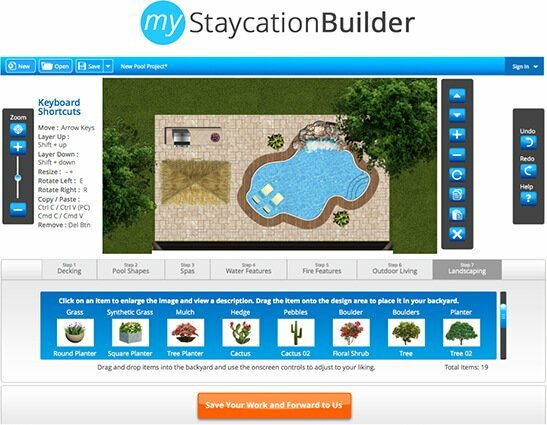 Ready to Add MyStaycation Builder to Your Site? You can get your own custom domain at yourcompanyname.mystaycationbuilder.com and bring up to 100 new leads to your business every month for $79/mo. This tool is a white label solution that can be branded with your company logo and integrated into your existing site. We’ll also set up response emails so your sales team can automatically receive customer details and finished designs. If you think you’ll have more than 100 users per month, we have a Pro Package that gives you all the benefits and features of the Basic Package, plus allows for unlimited new registrations. 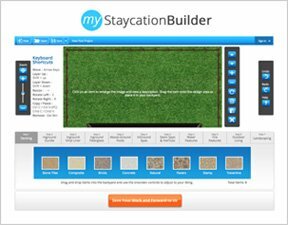 If you are interested in learning more about how My Staycation Builder can benefit your company, or if you have any questions about the features or pricing, please email me using the form on this page and I’ll be in touch soon.